Glenwood Springs is a quaint little town in the Western Slope of the Colorado Rockies, tucked in at the confluence of the Roaring Fork and Colorado rivers. Incorporated in 1885, it’s now home to around 10,000 people and is best known as a historic destination for vacationers who want to enjoy the natural beauty, hot springs, and modern dining and recreational activities. But what if there’s something … spookier … beneath the surface of this little town? Glenwood Springs wasn’t always the quiet, idyllic vacation destination it was today. It was founded as “Defiance,” a name still used by local teams and businesses. In 1883, Defiance was more camp than town, full of tents, saloons, and brothels, as well as all the shady characters that came along with them. As the town grew, so did the number of buildings — private cabins and lodging establishments among them — and the little town of Defiance began to fill up with miners, trappers, traders, gunslingers, and prostitutes. In 1885, town founder Isaac Cooper petitioned the founders to change the name of the town from Defiance to Glenwood Springs. His wife, Sarah, was having difficulty adjusting to frontier life, and he thought the name change — after her hometown of Glenwood, Iowa — would make her more comfortable. John Henry Holliday was a dentist — but that’s not what he’s famous for. He was also a gambler, gunfighter, and a good friend of Wyatt Earp, and he’s best known for his role in the events that led up to the infamous Gunfight at the O.K. Corral. Holliday had a reputation for having killed more than a dozen men, but modern historians have concluded that, like so many tales from the Old West, reports may have been exaggerated. In October of 1881, Holliday, Wyatt Earp, and Wyatt’s brothers, Virgil and Morgan, went to confront some cowboys who were in violation of the town’s disarmament ordinance. When the dust settled, three of the six cowboys were dead and the other three had fled. Holliday, Virgil, and Morgan were wounded in the fight. In 1882, after several months of escalating violence involving the Earps, Holliday parted ways with them and made his way to Colorado. His health was failing rapidly, and in 1887 he made his way to Glenwood Springs, hoping that the vapors of the nearby hot springs would help his ailing lungs. The springs weren’t enough to save him, though, and he died on November 8, 1887. As the story goes, Holliday was then buried in Linwood Cemetery in Glenwood Springs. Today, you can take a short hike up to the stone that bears his name if you like. But some maintain that the rocky soil and frozen ground in November would have made it impossible to dig a grave — and that the road would have been too steep to transport a body in the snow anyway. Harvey Logan, also known as Kid Curry, is also buried in Linwood Cemetery, near fellow gunslinger Doc Holliday’s grave. In 1904, outside of Parachute, Colorado, law enforcement tracked down Logan and his gang after they stole some horses, shooting and wounding Logan as he tried to escape. Logan decided to end his own life in order to evade capture, and there his story ends. Or does it? His body wasn’t positively identified due to the self-inflicted gunshot wound, and rumors persist that law enforcement got the wrong man. Of course, Holliday and Logan lived over 100 years ago, so they’ve long since left this world. But some superstitions hold that unmarked graves, unidentified bodies, and graves that were robbed after they were dug are bad omens. Wherever Holliday and Logan’s bodies actually lie, some believe that their spirits are forever tied to Glenwood Springs. Hotel Colorado — Is The Grande Dame Haunted? 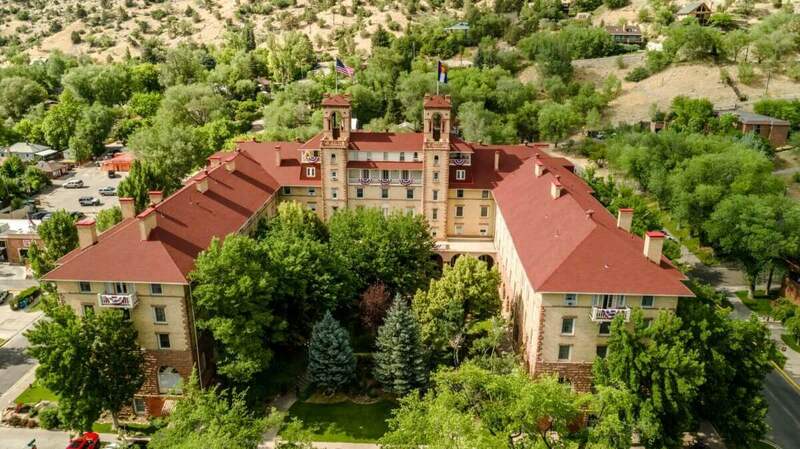 One of the oldest and most striking buildings in Glenwood Springs is the Hotel Colorado. Built in 1891, when the surrounding town was still in its infancy, the Hotel Colorado was a towering Tuscan-style landmark in a town of log cabins and tents. The hotel has played host to a number of famous guests, from the mobsters “Diamond” Jack Verain and Al Capone to Presidents Taft and Roosevelt to “Unsinkable” Molly Brown. The hotel even served as a US Naval Convalescent Hospital during the Second World War, serving over 6,500 patients. Over the years, hotel guests and staff have reported seeing some strange things in the rooms and halls of this hallowed building, most notably in the wee hours of the morning. Guests have reported seeing elevators move from floor to floor, opening and closing with no passengers in them. Some report the inexplicable presence of cigar smoke, even though the hotel hasn’t allowed smoking in decades. In the historic Devereaux Dining Room, named after the hotel’s founder, some people have reported the smell of perfume and the sound of dishes moving around even when the room is empty and service has stopped. Perhaps most chilling are the reports of a young girl, dressed in Victorian-era clothing, seen playing with a ball in hallways throughout the hotel. Some men have even reported being awoken by the apparition of a woman. There are even stories of screams being heard through the hotel, believed to belong to a chambermaid murdered by a jealous lover. The room in which she is believed to have been killed was once a guest room — it’s been since converted to a storage room due to the reports of paranormal activity in the chamber. A hotel this old is sure to have some secrets — just recently, renovations uncovered original wood floors, brick walls, and fireplaces that were plastered over in the 1940s to convert the hotel to a hospital. Construction workers also uncovered a hidden door, leading to a large storage room. Does the famous hotel hold other secrets, lost to time and forgotten? Have some of its famous guests decided to linger long after their deaths? Are the spirits in the hallways the product of overactive imaginations, or something more unknowable? 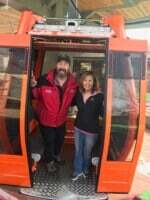 You’ll have to come visit Glenwood Springs and see for yourself! Learn more about the Hotel Colorado and see more pictures HERE!